It was reported in the media today that Blenheim, a small town down south, has an anonymous vigilante fighting against boy racers with loud exhausts. 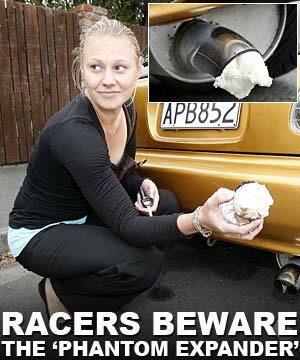 Quoting from stuff: In an anonymous letter sent to The Marlborough Express, the self-styled “Phantom Expander” said he or she was randomly targeting vehicles with wide exhausts and filling them with the expanding foam. “I have taken it upon myself to respond to the socially maladjusted Blenheim pinheads that have chosen to have a wide-mouthed-boy-racer exhaust installed on their car,” the letter said. Four cars that had fallen victim to foaming had so far been brought to his shop for repairs. The worst-hit car had its exhaust system removed and the foam burnt out. In the letter the phantom said the “public service” would continue until the “inadequate nobheads get the message”. The writer advised owners of “wide-mouthed blower[s]” to ditch them otherwise their turn would come. “It may not happen tomorrow, next week, or next month, but it will happen. Enjoy!”, the letter said. Yep you just gotta love the Phantom Expander! I’m thinking of setting up the Auckland branch of Expanders Inc. I HATE NOISY EXHAUSTS!!! I wish NZ would pass laws outlawing these assholes… big wide assholes at that! This may be our man. but i sincerely hope there is no one expander! I hope they breed like flies & boy racers become an endangered species…..
And once they do become an endangered species, I sincerely hope tunnel tooters become the next target…. I have more than once considered donning ear muffs, arming myself with condoms full of paint stripper & sitting mid way through the Mt Vic tunnel, ready to respond to their inane toots….